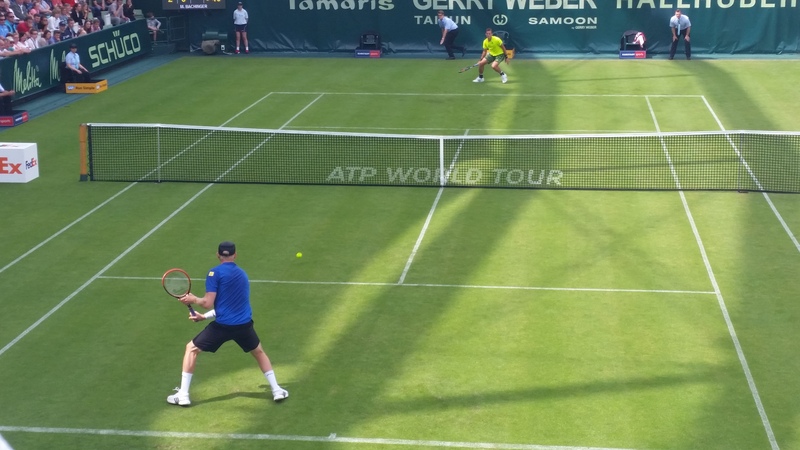 The grass season is in full swing and as the opening weeks in Stuttgart, Nottingham and ‘s-Hertogenbosch conclude, events in Birmingham, Halle and Queens begin. As a result of the extended stretch on grass both the German and English ATP grass-court stalwarts have been elevated to ATP 500 events. Over the next nine days, TTI will be present in Halle and cover all the action at the Gerry Weber Open. On a muggy, humid Saturday, play got underway in the Halle at 11:30 am. First out on court was Janko Tipsarevic — well, on the wrong court. Scheduled on Court 2, the Serb walked out on Court 1, where people slowly started settling in for the match between Benoit Paire and Tim Puetz. Tipsarevic walks out on court. People applaud. "Janko, you're on the wrong court" "Oh." Tipsarevic turns around, waves goodbye. Once the returnee made it to the correct court, he probably would’ve wished to stay out on Court 1. Drawing last year’s finalist Alejandro Falla in the first round of qualifying was an unrewarding task for the 30 year-old Serb. The Colombian loves the grass — as his timing allows him to take the ball early off of the low-bouncing surface and rush his opponent — and that’s precisely what Tipsarevic struggled with today and saw him exit the singles event at an early stage. At the same time on Court 1, the two players who were supposed to be in action took the court and despite dominating the first set, resident gass-o-phobe Benoit Paire saw the match slip from his hands. The Frenchman benefitted from countless double faults off of Puetz’ racquet, and despite getting into discussions over some (admittedly dodgy) line calls early on, he kept his cool. Towards the end of the second set and in the decider, however, things unraveled quickly for the 26-year-old. Puetz, who came into qualifying with a wildcard, ended up taking the final set 6-2. The German will meet Falla in tomorrow’s final qualifying round. Benoit Paire and grass: it’s complicated. 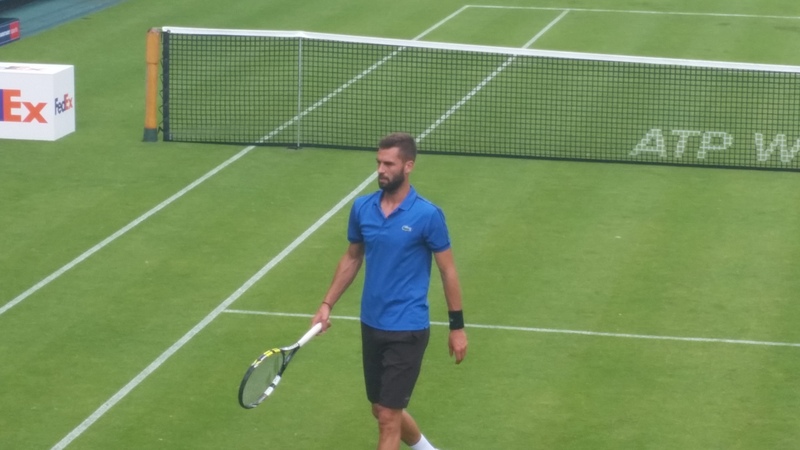 Paire, unsurprisingly, was rather fed up with everything, the world and particularly the grass after his match. Before the rain delay during the middle of the day, Lithuanian Ricardas Berankis wrapped up his first round win in qualifying, 6-4, 5-7, 6-4, over American lefty Austin Krajicek. The Amercian made him work hard for it, though, turning the match into a close three-set affair. A disruption of nearly two hours affected the second batch of matches. All of Rayan Harrison-Tatsuma Ito, Filip Krajinovic-Jarkko Nieminen and Vasek Pospisil-Matthias Bachinger were forced to stop play and leave the court. The rain only briefly postponed Ryan Harrison’s fate. For Harrison, it looked as though he might have been saved by the bell, as he trailed Ito 4-6, 2-5 before the rain set in. The American’s movement around the grass looked tentative and he struggled with both his range and a few bad bounces; Ito, on the contrary, had his feet firmly planted on the surface and moved around the court with ease. The rain only proved to prolong what seemed inevitable for the 23-year-old from Louisiana as Ito broke as soon as both players returned to the court — under the watchful eye of very famous fellow Japanese player. Meanwhile on Court 1, Pospisil, the top seed in qualifying, followed up his emotional outburst from a few days ago with a very businesslike performance against the local Bachinger. The Canadian didn’t waste any time after the rain delay, delivering a second set bagel. Bachinger had few answers to the Canadian on this day. Nieminen squeezed past Krajinovic in two tight sets whereas Lukas Lacko and Jürgen Melzer scored tight three set wins over Peter Gojowczyk and Ruben Bemelmans, respectively, later in the afternoon. One of the main attractions of the day was the Champions Trophy — the only match on Centre Court. 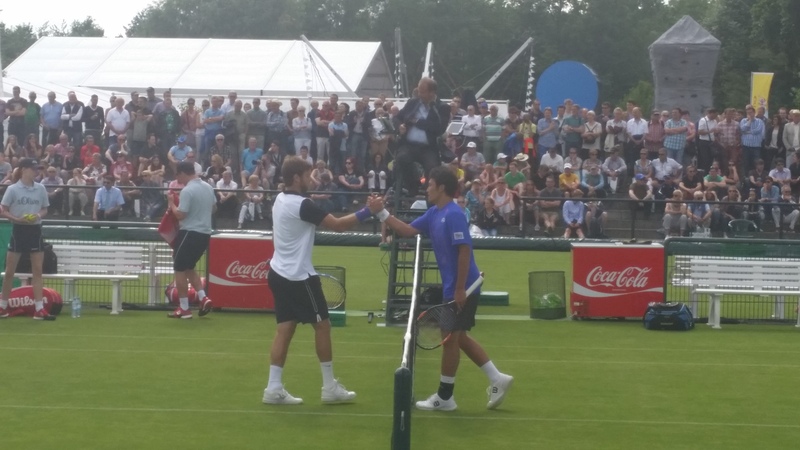 For the exhibition event, noted grass-court aficionados Sabine Lisicki and Angelique Kerber teamed up with Henri Leconte (the winner of the first edition of the Halle tournament) and Michael Chang. Naturally, it wasn’t all serious competition, and soon, the Frenchman was up to his entertaining tricks in which the two Germans as well as the American joined in happily — much to the delight of the crowd. Leconte and Lisicki eventually won 7-5, 7-6(5), but suffice to say it was more about fun rather than the score. Tomorrow will see the final four qualifying matches in singles, as well as a celebrity doubles and the final match in the doubles qualification between Nicholas Monroe/Artem Sitak and Lukas Rosol/Sergiy Stakhovsky. The match between Puetz and Falla will open proceedings on Court 1, with Pospisil-Berankis on Court 2 as Centre Court gets a final day of rest until the main draw action kicks in on Monday. Until then – auf Wiedersehen!